Following u Nvidia's 8800GT splash, ATI has also launched a pair of mid-range graphics chipsets to cater for the mass market. 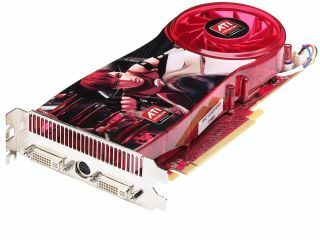 The cards will be available from today through ATI's partners as the Radeon HD 3850 and 3870. The GPUs introduce a new nomenclature, too, since the Pro and XT suffixes have disappared. Now, says ATI, the higher the number, the better the card. The 3850 ships with a 670MHz clock, while the 3870 will run upwards of 775MHz - ATI is leaving room for partners like Sapphire to release overclocked versions of the card with their own cooling solutions. Like the 8800GT, the HD 3000 series supports PCI Express 2.0 but is backwards compatible with older boards. And, like Nvidia's equivalent card, there's also support for the forthcoming 10.1 iteration of DirectX which we'll see in Windows Vista Service Pack 1. The single-slot 3850 has 256MB of GDDR3 with a clock of 900MHz. The 3870 is a dual slot board however, as it has 512MB of GDDR4 clocked at 1.2GHz. ATI says the thirst of the latter card is 106W. AMD's PowerPlay tech remains on board to manage power and requisite fan speed. The new cards have 320 stream processors and 666 million transistors on die. Based on a new 55nm process, the series was previously codenamed RV670. ATI also introduces a new version of the company's CrossFire multi-card tech - CrossFire X. Two, three and four card configurations are supported - the latter two from January. Dual-link DVI is also a feature, as is HDCP support with AMD's Unified Video Decoder (UVD). HDMI can be delivered - including audio - via an adapter.